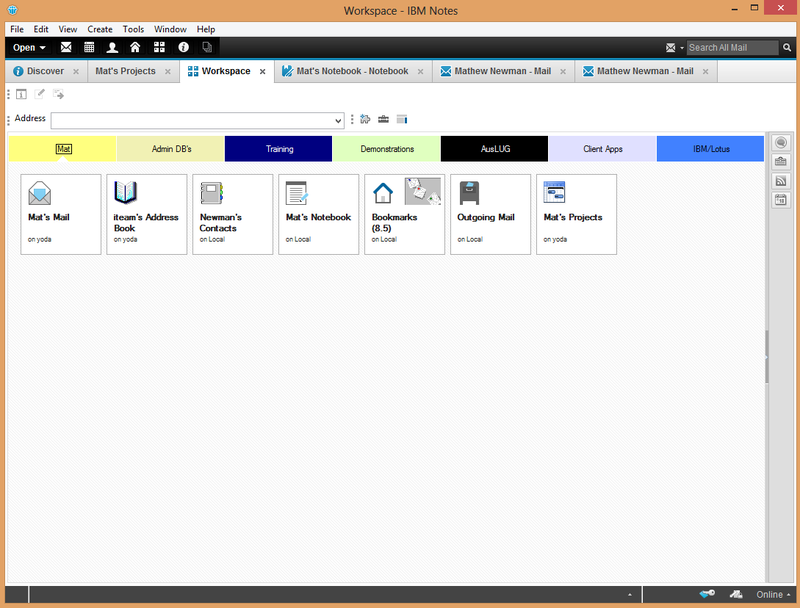 One of the features to receive the biggest makeover in IBM Notes 9 is the startup screen, with the introduction of the all-new 'Discover' page (or rather: pages). 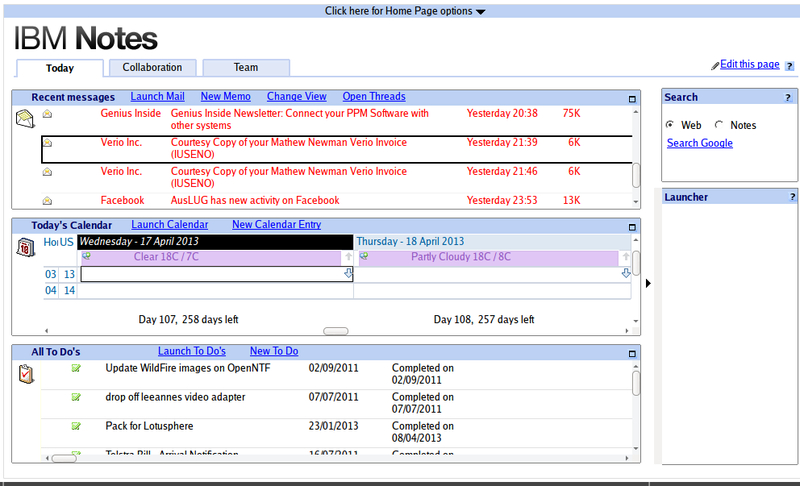 Previous releases of Notes utilised the notes Workspace (Lotus Notes 1-4) or the Welcome screen (Notes 5 - 8) as the content of the 'display' pane users first encountered when the Notes client is launched. To access the updated interface for the Workspace, users who had previously selected 'Textured Workspace' (an option available since release 4) need to turn this off, as the 'Textured Workspace' option over-rides the new interface for the workspace. 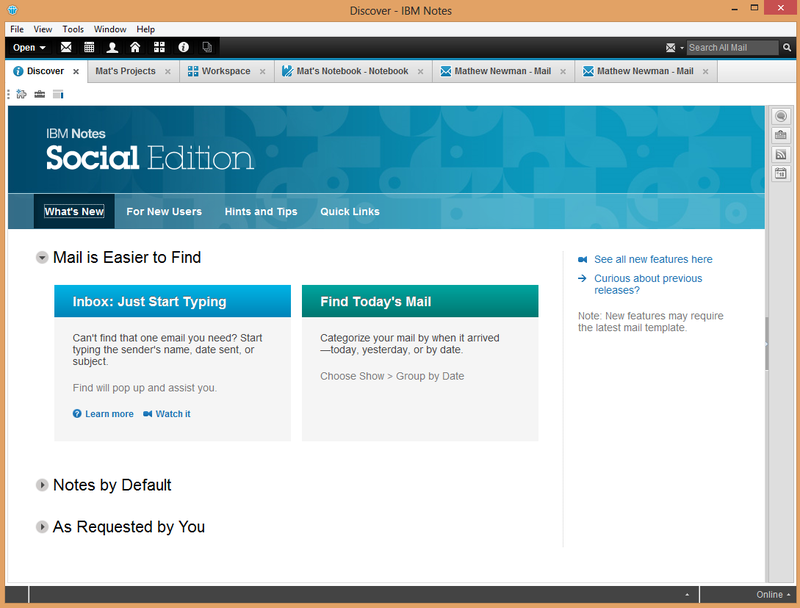 IBM Notes 9 users will 'discover' a lot about Notes (and other Applications) by using the new Discover Page. 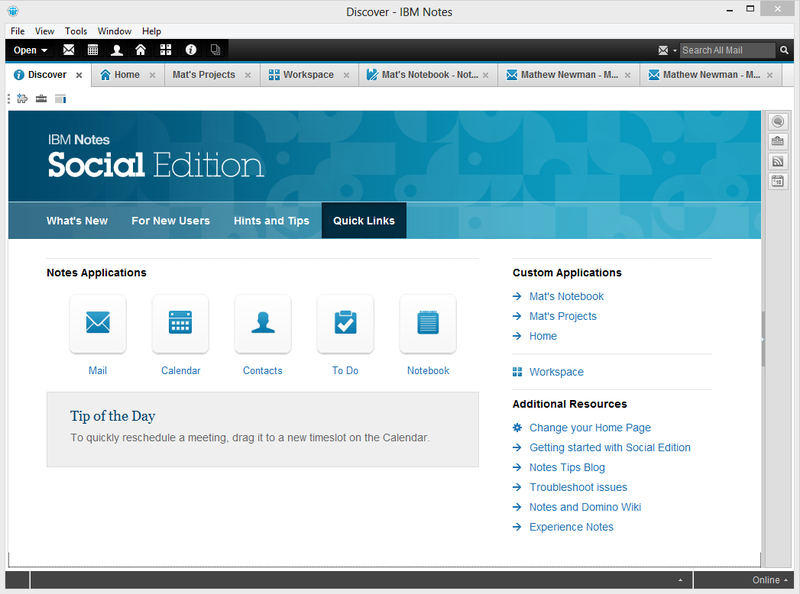 Figure 6: The new default Notes Home Page - "Discover"
Each of these new pages includes some handy information, assistance and links to help you make the most out of the Notes client. 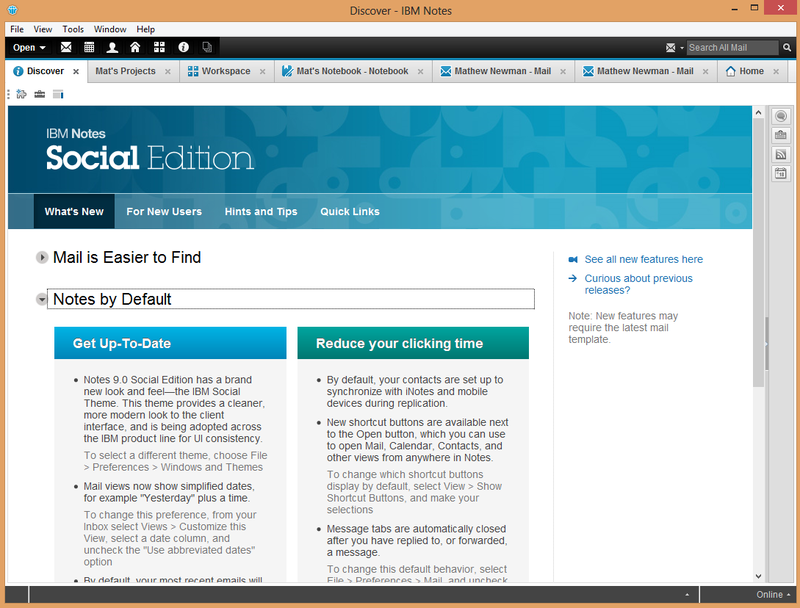 What's New is a fantastic way for users to 'discover' many the new features of IBM Notes 9, right from their welcome screen. 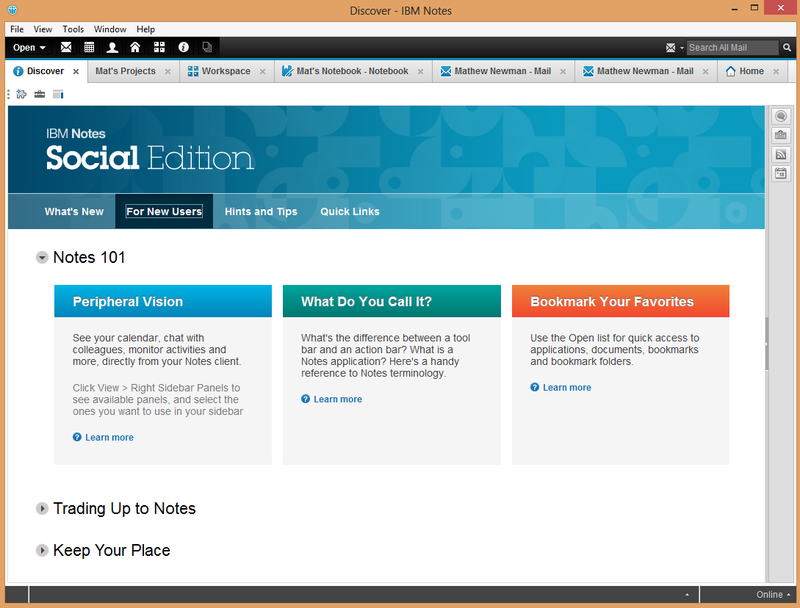 With hints, tips and summaries of many of the new features and options available in Notes 9, the What's New page also includes links to video tutorials, help articles, wiki's and a fantastic summary of one of the biggest changes in IBM Notes 9: some of the options that are now applied to the Notes client as default features. 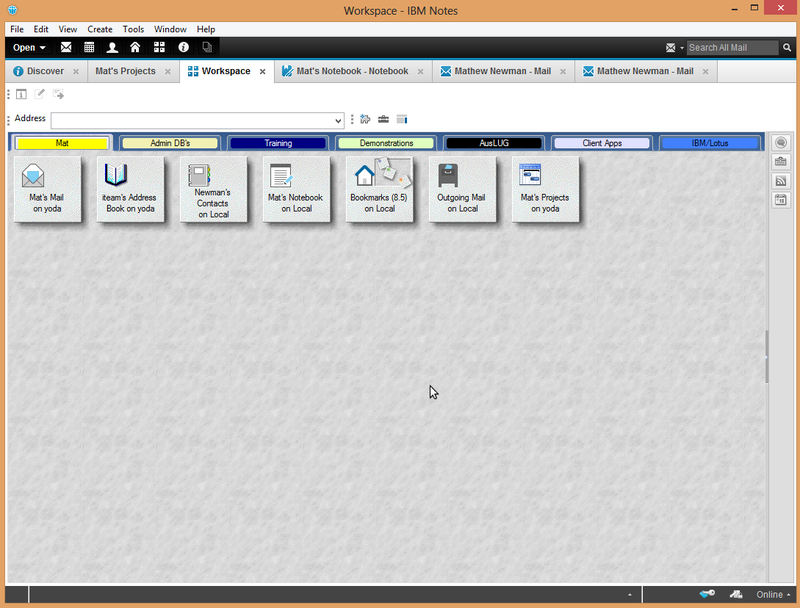 IBM Notes 9 is the first version of Notes that introduces NEW features AND enables those features as DEFAULT options. Not only have IBM chosen to enable many of the new features in Notes 9, they have also retrospectively enabled features that have been available - in some cases - for a number of previous versions. It's fair to say that Notes has received it's fair share of negative opinion over the years due to Notes having a feature, users not knowing about it, and then complaining that Notes 'lacks' something. 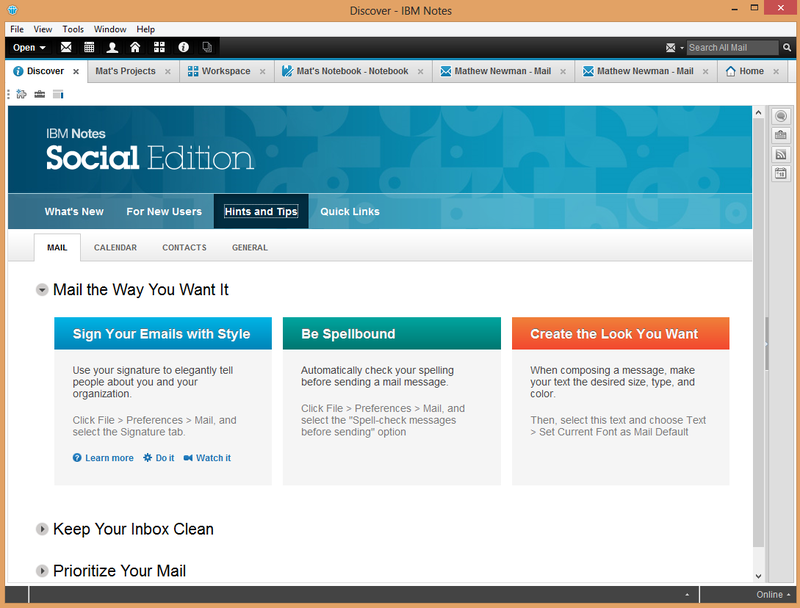 In my opinion, this change in IBM's policy toward enabling features as defaults - rather than relying on user education, or application by an Administrator via a policy settings document - is a huge step forward. One of my favourite features of the Notes 9 Discover Page, rather than a single 'Tip of the day' that was available in previous releases, users can find 36 great Notes tips, including descriptions of features, functionality and preferences that can be set within the Notes 9 client, many containing either details on how to enable the feature, or links to help files, wiki entries and videos that describe the feature in more detail. Last - but by absolutely no means - least; is the brilliant new Quick Links tab on the Discover page. 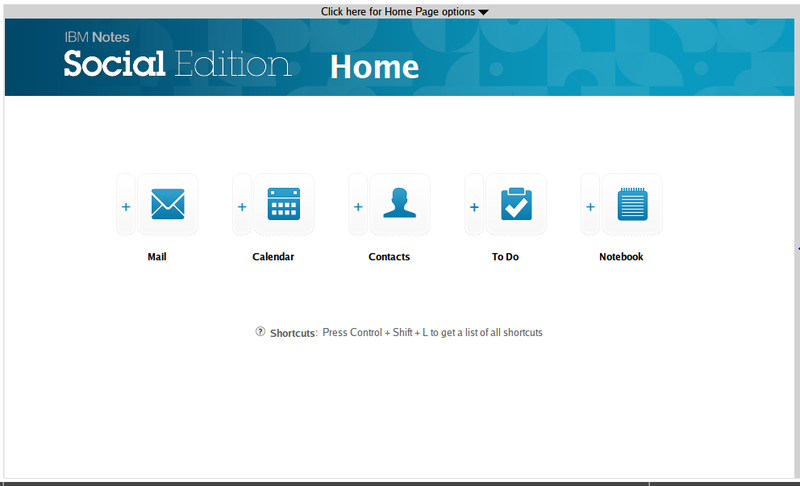 I'm sure that this page will become the default Notes 9 start-up screen for many users, as it offers quick access to the core Notes PIM applications (Mail, Calendar, Contacts, To Do, Notebook) as well as Connections Updates, Custom Applications, the Notes workspace and "Additional Resources". Custom applications are automatically added to the list for you (up to 6) that feature the applications that you have most recently accessed within the Notes client. As with all release of Notes since version 5, the user has the ability to choose their own startup screen, rather than that provided by default. Simply, all the user has to do is Bookmark any page, application, database or web-site, and then right-click the bookmark and choose Set Bookmark as Home Page. There's a LOT to love about the new Notes 9 interface, the Discover page is one of those great new features that will help get you started. Question -- how do you modify the Discover page? Where does it load from? Seems there are no resources on the web for this, and while I agree that the Quick links page is great, I would very much like to customize it. So far what I found was that if you update the txt file, after a restart of the client, the changes comes through and the html file seems to be updated as well. So, I see the files (populatedTemplate.txt and populatedHTML.html) that needs to be modified to effect changes in the Discover Page but I don't see where they come from.. they are there AFTER the install but I see them nowhere in the install package... which means they must be created from somewhere but I don't know where.... anybody any ideas? 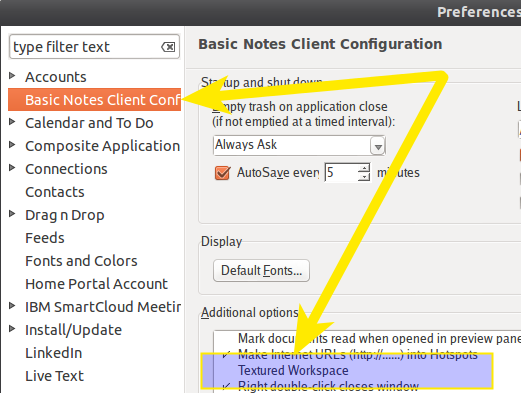 The new Notes discover page can be controlled by new user policy settings located in the "Desktop Settings" document. Look under the "Basics" tab at the new "Discover Page" section. Thanks for a great site. A wonderful topic would be an email introduction for those familiar with Outlook, Thunderbird, Gmail etc that are using Notes as a email Client for POP for the first time with Social Edition. 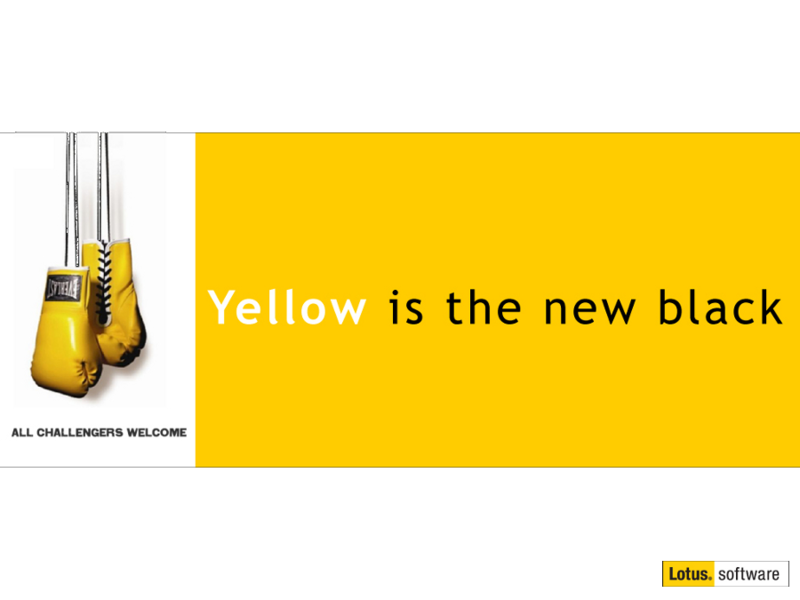 There is a sharp learning curve for those not familiar with the Notes Way. Hi I am new to Lotus Notes and I would like to know how to split my screen so I can upload two separate documents on the same screen. Due to webmaster push-settings, at some updates my folder layout is set back to a primary setup. So my date, size, subject etc are in inconvenient order again. Covering over 60 k mails it is a disaster to set it all back. My inconvenience is not enough to get the webmaster to support me. In which files is the folder layout saved? How can I change my weekly calendar view to show Sunday as the first day of the week?